VIDEO: Warriors vs. Thunder Game 4 Full Highlights - 2016 NBA Western Conference Finals - Balita Boss! 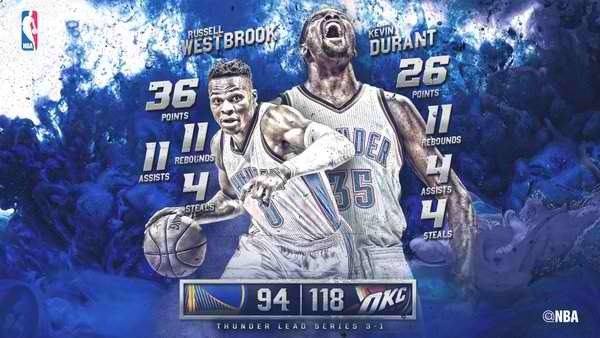 The Oklahoma City Thunder are now just one win away from the NBA Finals series after a 118-94 victory over the Golden State Warriors in Game 4 of the 2016 NBA Western Conference Finals. Russell Westbrook had 36 points on 12-for-27 shooting, 11 assists and 11 rebounds, logging his first triple-double of this postseason. Kevin Durant finished with 26 points, 11 rebounds, four assists, four steals, two blocks. Stephen Curry led the Golden State with 24 points and Klay Thompson added 18. Warriors on the brink of elimination now trail the Thunder 3-1 in series. The defending champion must win Game 5 on Thursday in Oakland to keep their season alive.